Melanie realises that Kelvin, a waiter at Lassiter's is her secret admirer. She agrees to go out with him out of pity. Josh hacks into Erinsborough High's Computer and changes Todd's report marks. Melissa looks worried. Josh carries on with his hacking and changes the teacher's comments on Todd's report. Todd gets a bit scared and tells Josh to put it back as it was. Just then, Jim and Beverly come in and they hide the screen quickly. Josh says it's too risky to carry on hacking there - he'll change Todd's report back when he gets home. Melanie and Christina are hanging out. Melanie tells her the identity of her secret admirer. Christina is shocked - he's the very clumsy guy. Melanie explains what happened and that she's agree to go out with him - but he's not her type. MELANIE: Chrissie, why do I do these things?! Christina says he might be alright underneath - stranger things have happened! Todd and Melissa are trying to decide what to do today. Josh comes round with an advert - someone is selling a trail bike. Todd gets really excited and agrees to go straight over to check it out. Melissa rolls her eyes. Jim and Beverly have been playing golf again. Jim sees Paul coming out of No.22 and storms over to tell him off. He says it's improper for Paul to move in with the twins - he's always mixing business with pleasure. 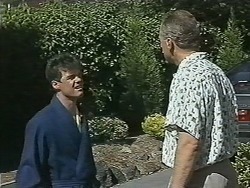 Paul gets angry and says that his living arrangements are his own business. Todd, Josh and Melissa are looking at the trail bike. It's $500 and the owner is selling because he's buying a Harley. It seems like a good deal and Todd says he'll take it, but he can't get all the cash until Monday. He agrees to give the bloke $50 deposit. He goes off to try to drum up the cash. Melanie and Kelvin are on their date - at the zoo. There is a long musical montage of them going round looking at various animals like seals, elephants, monkeys etc. Paul is trying to persuade the girls to go out clubbing tonight, but they don't want to. Jim is practising his putting by hitting a ball into a glass. Todd comes in and tells Jim about the trail bike and the deposit. He asks Jim to lend him the money, but he doesn't want to - Beverly doesn't want him to have a trail bike. Todd is upset and says he's been saving for over a year. Todd begs Jim hard - it's such a good deal on the bike. Jim finally relents and lends him the money - he thinks Todd has earned it by working hard and being responsible. Melanie is trying to get rid of Kelvin, but he is very persistent. They have a bit of a misunderstanding about Jamie's parentage and Melanie goes with it, pretending she's going out with Des and Jamie is her son. Paul comes in and blows her story though, telling Kelvin that Melanie and Des are just friends. Paul and Caroline are showing Christina around the Gift Shop. Paul hopes Christina will create her own personal atmosphere - she looks a bit nervous. They bombard her with advice. Todd is in a very bad mood - he is in trouble about his report card on the computer at school. He hasn't been found out, but the new principal has put his name down for the High School Challenge Quiz because he thinks Todd is a brain! Melissa has been picked too, but at least she got her grades on merit. Josh promises to sort it out. The phone rings and Beverly answers it - it's the bloke ringing about the trail bike. Beverly gets angry and tells him that Todd isn't allowed to have a bike. Jim tells her that Todd has his heart set on the bike. Beverly becomes very angry that Jim knew about the bike and didn't forbid Todd from buying it.